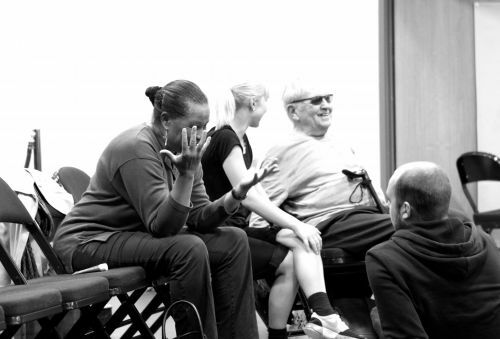 World-renowned choreographer Robert Cohan CBE and his long-time collaborator and composer Eleanor Alberga have been mentoring three choreographers and composers, all at various stages of their careers. They have been passing on their indispensable knowledge to continue their legacy of creating intuitive contemporary dance and music. Out of these questions rose the idea for the Cohan Collective, a two-week intensive choreographic residency conceived by Cohan, in collaboration with Yorke Dance Project and supported by Middlesex University. This took place from 24th August till 5th September, culminating in a sharing at the Place, London, where Cohan is the founding Artistic Director. The Cohan Collective’s mission is to further develop the depth and quality of choreographers’ and composers’ work and working methods. The choreographers being mentored were company dancers Jonathan Goddard, Phil Sanger and Charlotte Edmonds, alongside composers Rolf Hind, Donna McKevitt and Andy Kyte, with all having a chance to cross-collaborate and learn from one another. Both professional and graduate dancers were also involved, further widening the pool of reciprocal learning that this project achieved. Edd Mitton, Yorke Dance Project company member, took part in the Collective as a dancer; he was able to absorb information from everyone who took part, dancing for each of the choreographers and composers during the daily tasks. He was exposed to different ways of working but also, being a choreographer in his own right, he was able to question his own practice and asked himself ‘how would I respond to each challenge?’. Edmonds was recruited to take part in the Cohan Collective as part of Yorke Dance Project’s mission to maintain relationships with the young people who they work with, and to maximise the potential of young talent. Edmonds first worked with the company in 2013 at the age of 16, as their Causeway Young Artist in Residence. She is now joining The Royal Ballet for their 2015/16 Season as the first choreographer to participate in the new Royal Ballet Young Choreographer Programme, and she has been commissioned to choreograph for the Royal Academy of Dance Genẻe 2015 at Sadler’s Wells, London. The first week of the residency involved creative daily tasks set by Cohan and Alberga guiding the Collective through different processes of composing movement and sound scores in collaboration with one another. Trial and error is welcomed where there is no pressure to deliver a polished product, which is often restricted in the ‘real world’ by such factors as cost. Cohan says, “it’s not about whether you like or dislike what is made, it’s about if it works”. In a Facebook generation where we are constantly searching for approval in the form of likes, taking risks is often ignored. During one challenge, the composers were only allowed to use one pitch in their music making and the choreographers had to direct sitting down throughout the rehearsal day. Alberga, who recently opened the last night of the BBC Dance Proms with a commissioned piece expresses, “one aim of the Cohan Collective is to really push these choreographers and composers out of their comfort zones.” She mentioned how she has been recently watching George Balanchine’s Agon (1957) and that in Igor Stravinsky’s musical accompaniment, it is apparent that there was such a strong collaboration between the choreography and composition. Alberga commented that dance work today has departed from that prominent relationship between music and dance, and the Cohan Collective looks to bring this back. Kyte, who has just graduated from a classical music degree from Middlesex University, was pushed by Alberga to really ‘juice out’ the motifs that he made. He had only worked with dance once before and this opportunity enabled him to see sound visually and experience the choreographers’ interpretations of the tasks. He says it was great to collaborate intensively in such a way where thoughts constantly were “bounced off each other”. Yolande Yorke-Edgell, Artistic Director of Yorke Dance Project, has been mentored by Cohan over the past couple of years as both a dancer and choreographer. Sharing this experience is important to her to continue the flow of knowledge and experiences of all that is encountered when working with such influential figures. The Cohan Collective also involved daily class in Cohan technique taught by Anne Donnelly (Associate Professor at Middlesex University) and ballet classes taught by Paul Liburd MBE. Both have worked extensively with Cohan and Alberga during their time with London Contemporary Dance Theatre and throughout their subsequent careers. During the residency, participants also heard from two guest speakers about the process of collaboration, Richard Alston CBE and Stephen Montague. The idea of this was to make use of people whose practice has been inspired by earlier working experiences with Cohan. Having witnessed the project at the beginning, middle and end of the two weeks, it was clear that many revelations were made by those involved. This is a fantastic opportunity for choreographers, composers and dancers at any age and will be great to see the Collective make a return in the future. Nick Kyprianou’s professional dance training began at the BRIT School, and he has performed in high-profile events such as the London Metropolitan Police Charity Gala and at the Rhoda McGaw Theatre, Woking. At the University of Chichester, Nick achieved a 2.1 in Dance, BA (Hons), specialising in Queer Identity and was awarded the William Northam Prize for his outstanding contribution to the University and wider community. Nick has become a versatile dance artist, having experience of creating choreography, dance films and a range of contemporary dance techniques. Jasmin Vardimon’s work and how the body is immersed in a nexus of ideas, when performing, is of great interest to Nick; understanding the relevance of music, costume, lighting and other components to enhance a piece. Working with this company Nick has been able to learn firsthand many of Jasmin Vardimon’s processes. Having experience in many different dance styles, as well as acting, helps to inform his work, enabling him to create unique and engaging material with a fresh movement vocabulary. Nick has written for the Place, Bellyflop Magazine, Dance Matters and is regular contributor to the Wonderful World of Dance and London Calling. Nick continued his professional development at Trinity Laban, developing his artistry further whilst teaching dance and managing, producing and administrating various projects. He is currently working as the Marketing & Events Officer for Step Into Dance – the largest fully inclusive community dance programme in the UK, which runs in 200 secondary schools across London and Essex.